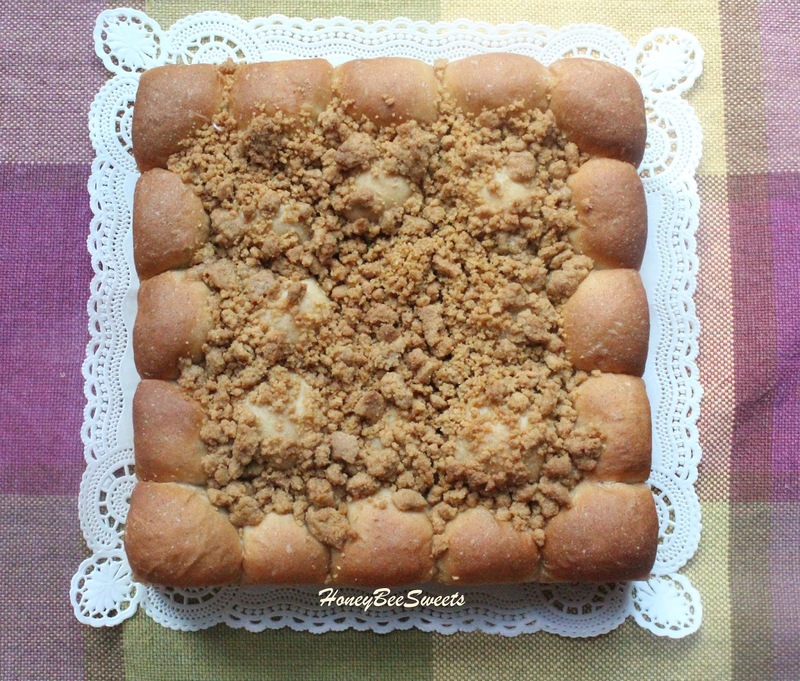 The buttery caramelized aroma is just so inviting! Such simple treats we can cook up right at home. 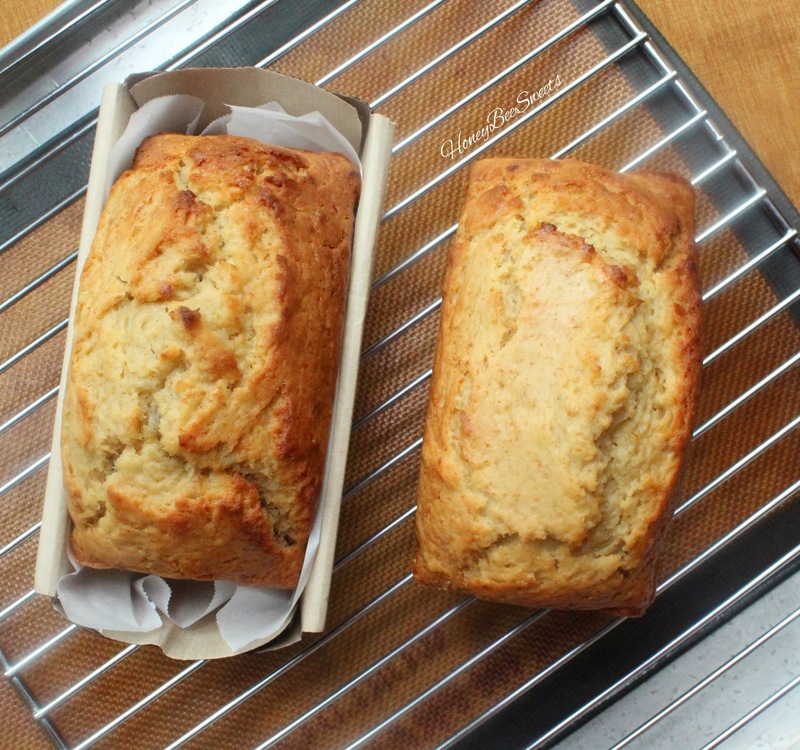 :) The key to makig this cake a successful one lies in making some good brown butter. 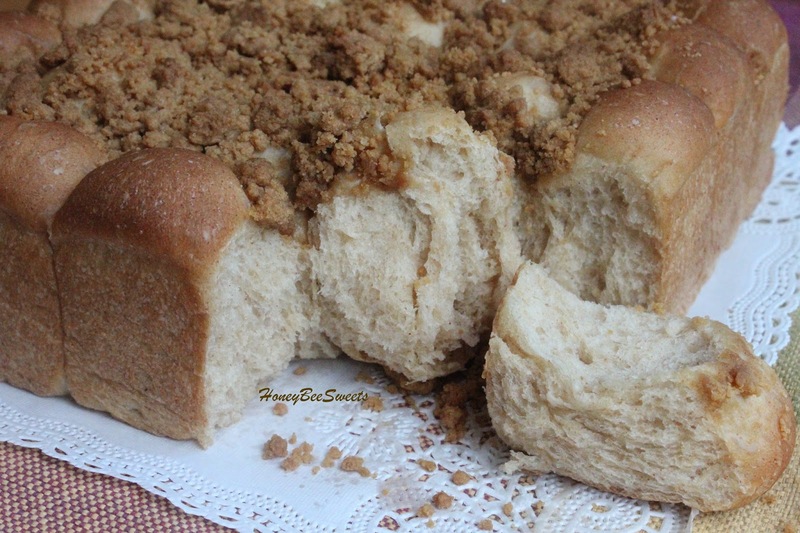 I got most of the tips from Joy the Baker, whom is like the queen of all brown butter bakes! Ingredients for this cake is probably all avaliable in your kitchen now, so let's get stared shall we? In a saucepan, add the butter in and cook over low fire. Once the butter has melted, keep a watchful eye over it. Soon enough you will hear popping and crackling sound. That is water cooking off in the butter. 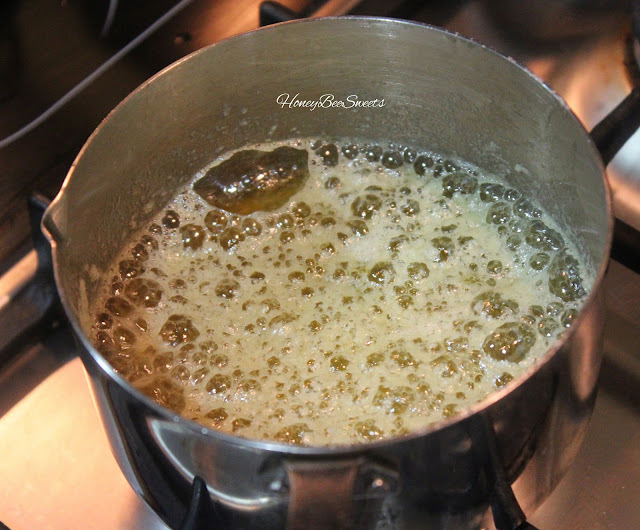 Once th water is cooked off, milk solids in the butter will begin to brown. 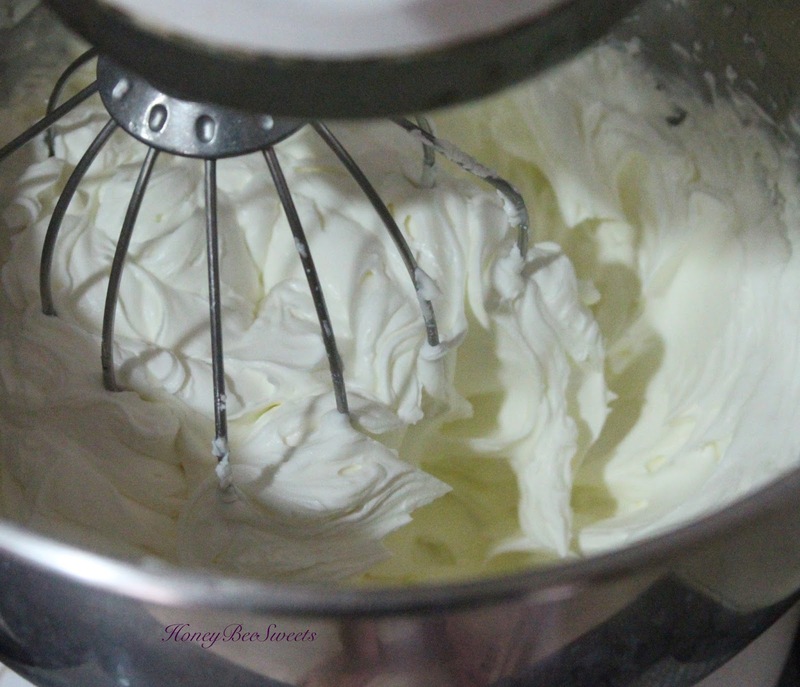 Swirl it gently and keep watch! To prevent the butter to brown too quickly, just remove it from the pan. 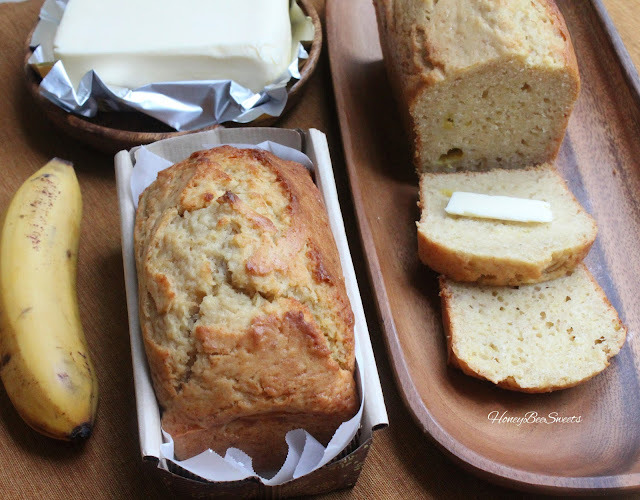 Set the butter aside and let it cool. 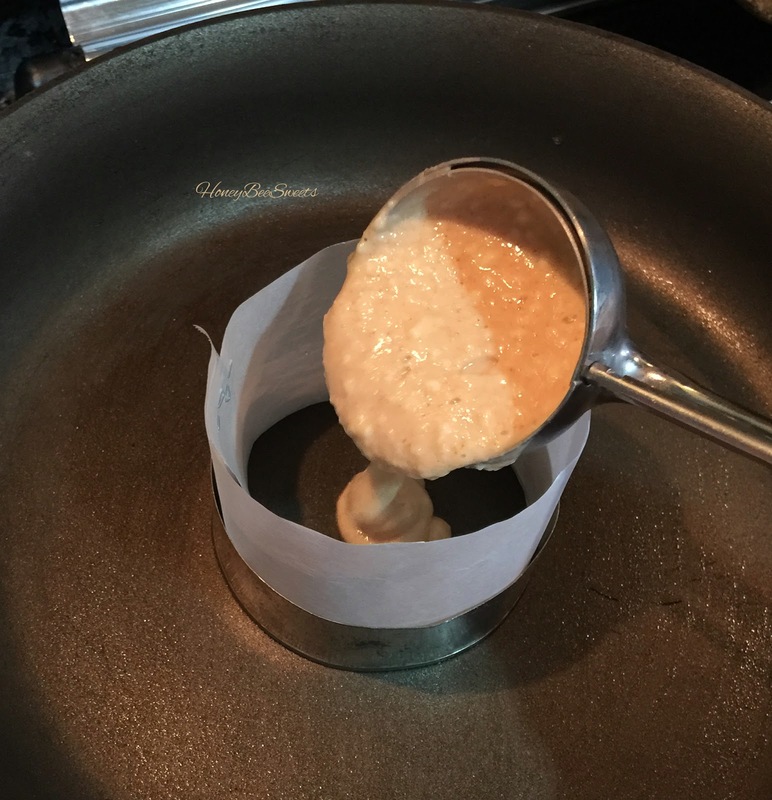 Once the brown solids has settle to the bottom and the butter is cool enough to handle, pour the butter out leaving the brown solids out. Preheat the oven to 170C. 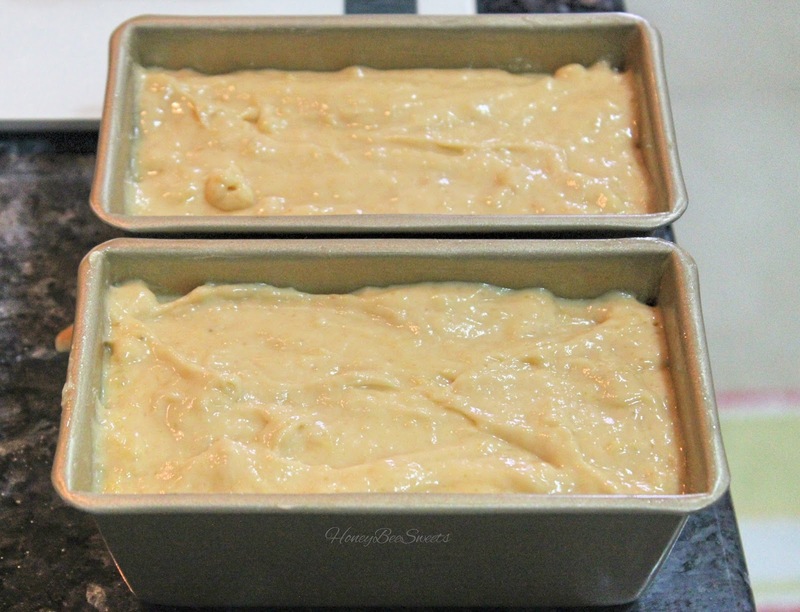 Grease and lined two small loaf or 1 big loaf pan. In a large mixing bowl, sift in the cake flour and baking powder. Add salt and give it a mix. Add in the sugars. In another bowl, combine the mashed banana, eggs, buttermilk and brown butter together. Whisk till well combined. Then add the wet ingredients to the dry. 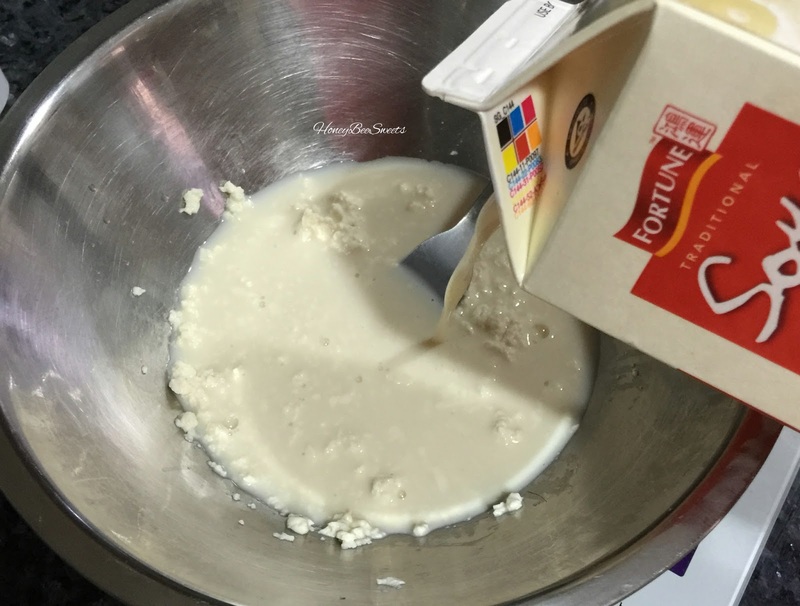 Fold it gently and do not over mix. 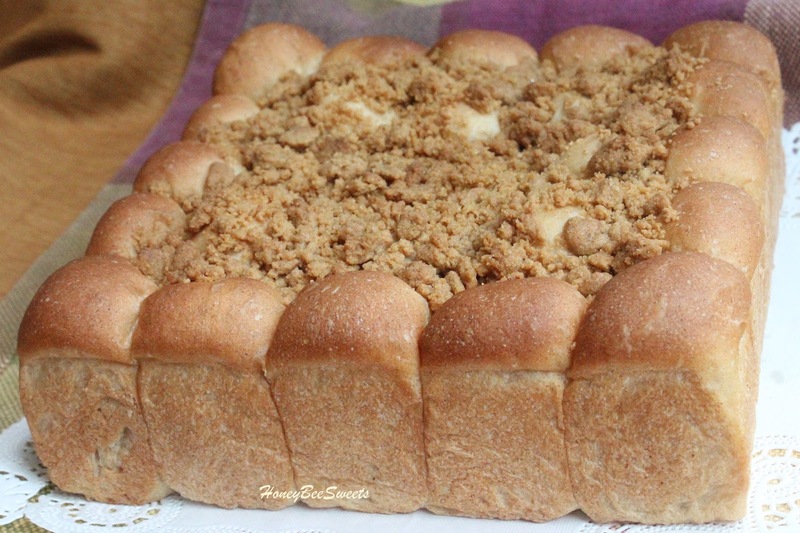 Pour the batter into the prepared pan and bake in the oven for 35-40 minutes for small loaf, 50-55minutes for a big loaf. Or till the tester comes out clean and cake is golden brown. Simple bake and yet so much depth in flavor and aroma. 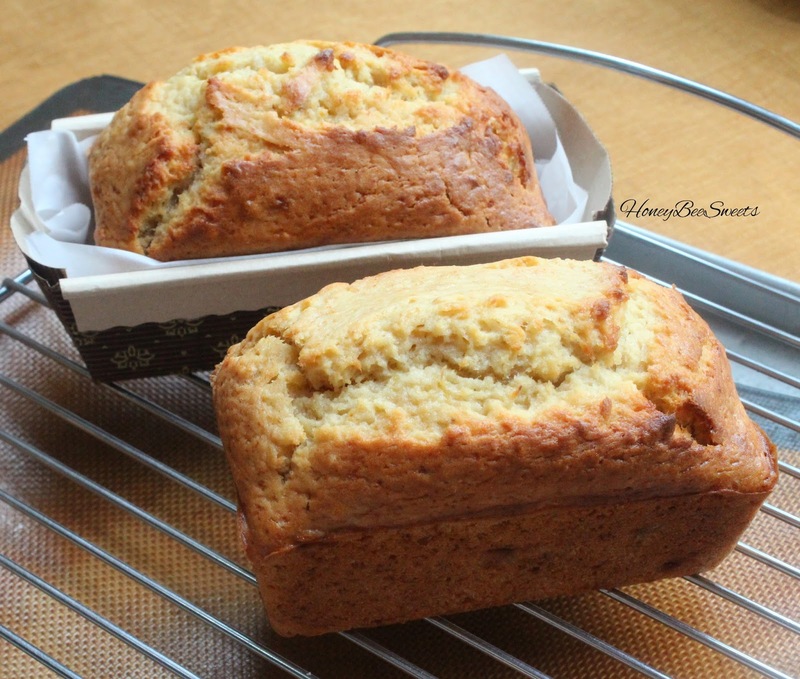 With the addition of buttermilk sure made this cake really soft and moist. 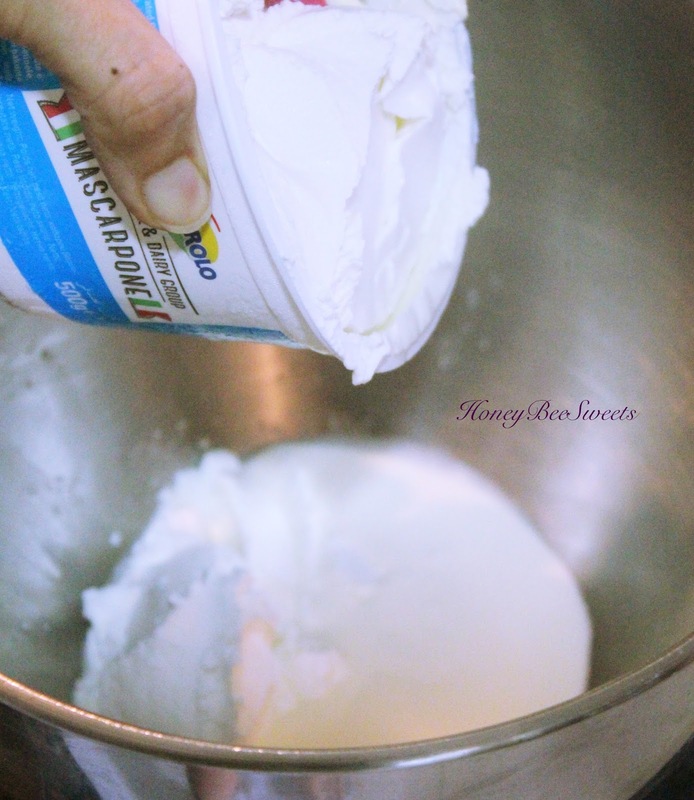 My tip would be try to get the real store bought buttermilk rather then making it with milk and lemon (unless you really an't get it), because it does taste different. Okay guys, gonna catch a couple more hours of shut eyes before I head out for more shopping later. Catch you guys later! 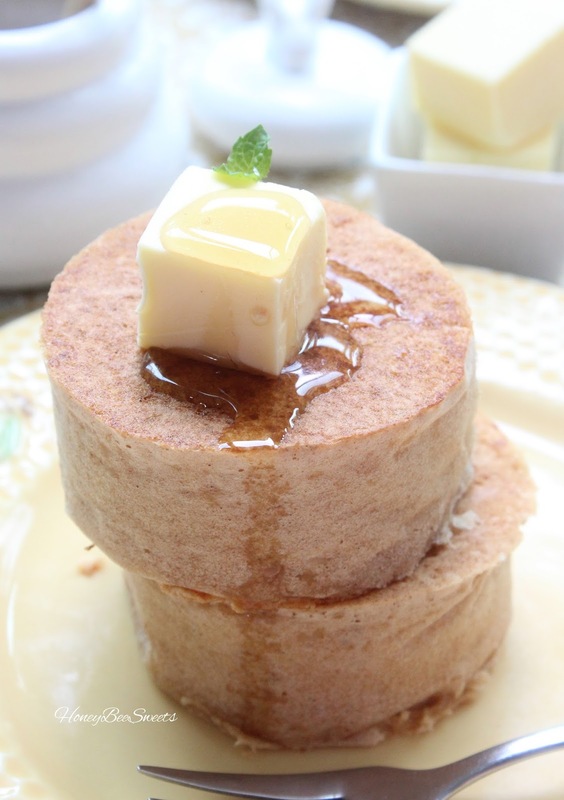 I believe most of us folks have seen those tall and really thick pancakes, either at the cafe or perhaps on some soical media platform. :P I am sure we all wonder how in the world did they manage to make such a thick pancake? Is there such a mould selling somewhere? Tell me! Well...instead of waiting for others to show me how or just wasting more cash in cafes eating dont know what they add in food, let's have a DIY session. Experimenting is my middle name...yeah it used to be chocolate. Anyway...I remember seeing it on some FB video awhile back and figured I give it a go, keeping my finger sna toes crossed, haha! As if I have not enough challenge on hand, how about trying it with a new pancake recipe? Yeah, I can't stand same-old same-old, plus I need to live up to my middle name yo. :P Result? Awesome~! I mean this is pretty decent right? Not as pretty as your cafe ones, but to be able to enjoy this at the comfort of your own couch, I mean home, it is a winner already. Plus at a fraction of a price too. 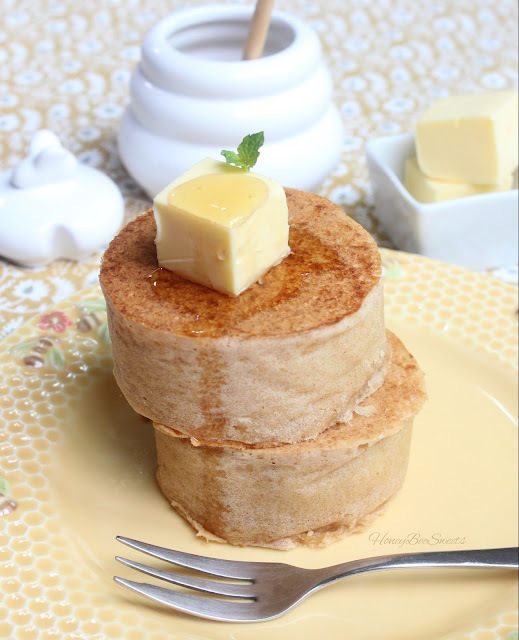 ;) So happy my Kinako pancake recipe turned out so well with this method. 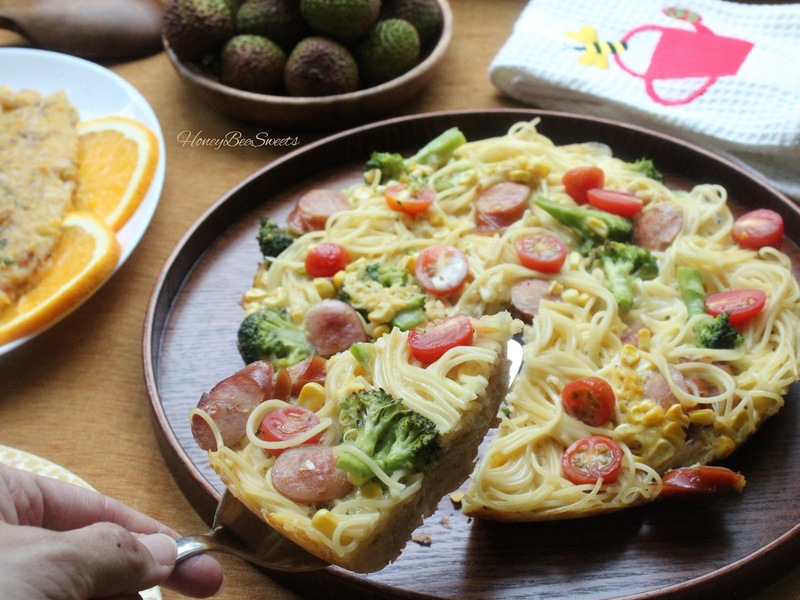 No eggs added mind you, so this recipe can be considered vegan too, woohoo! Without further ado ladies and gentlemen, let's look at what are the work involve here. First we need to prepare some parchement paper liners for the metal ring, which in a way help the pancake to rise easier and also for us to remove the ring with ease. I've made a short video on how you should make the parchement liners. You need to measure out the inner width and cut out the paper first. The width and height of the parchment needs to be at least 1" thicker. You need to make 5 of these liners. Next, make your pancake batter. One easy way is to blend everything in a blender. But I like to do it the traditional mixing way. 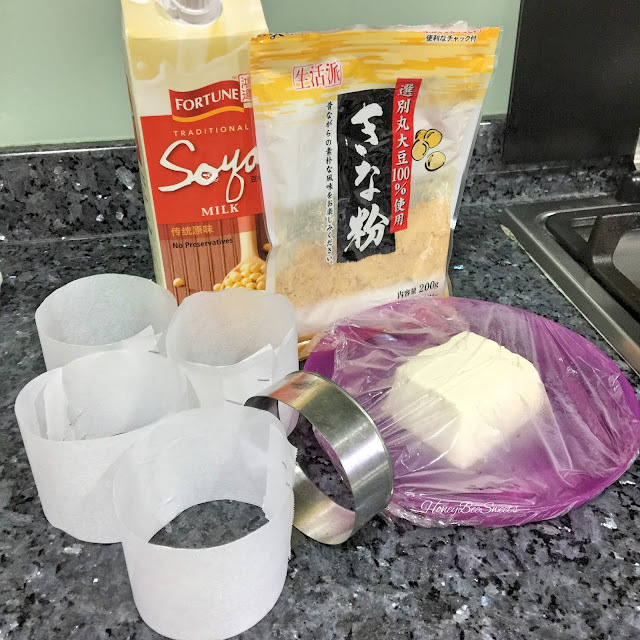 :) First, mash the silken tofu, then add in the soymilk and mix well. Next add in all the dry ingredients: Cake flour, salt, kinako powder, sugar, baking powder and soda. Give it a good whisk. Dont worry if the tofu bits are visible, it need not be perfectly smooth, but so long as it is not chunky will do. Heat up a non stick pan and grease it lightly with melted butter. Place your metal ring and one of the paper liners on it. Note that the one below is too tall, you only need about 1-2cm taller then the metal. If it's too tall, it will be hard to flip later. Make sure the fire is at lowest. The scoop about 4 tbsps of the pancake batter in. I used my ice cream scoop which I put two scoops. 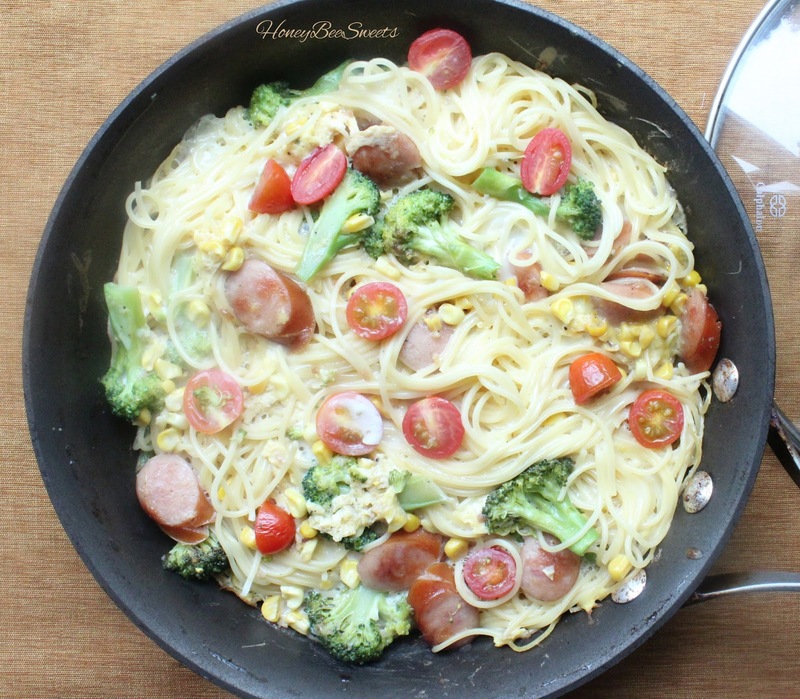 Cover the pan and let cook at low fire 5 minutes. I used my phone timer to keep track. 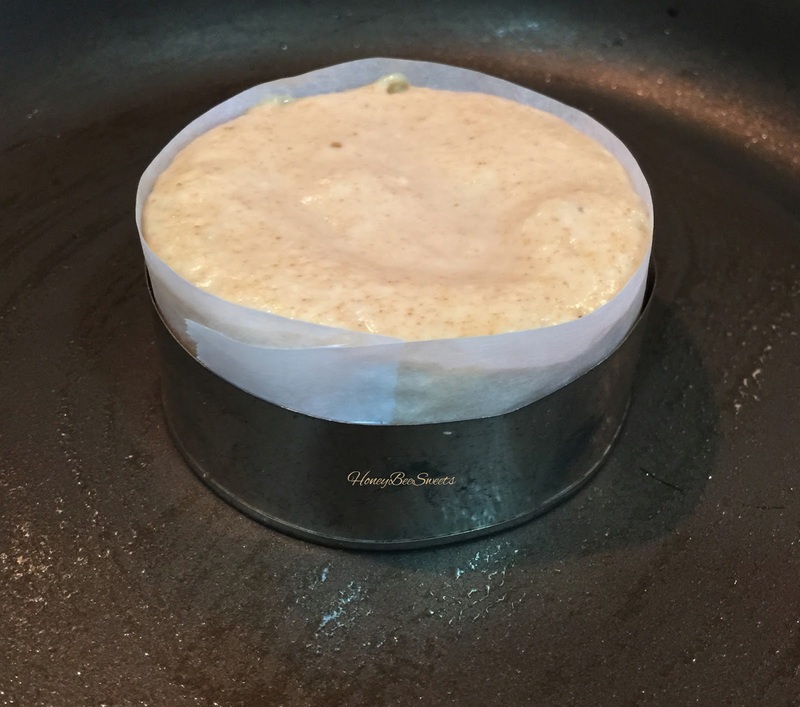 After 5 minutes, open the cover, you will realise the batter has rose up pretty high to the rim. Again note that the parchment paper liners are only about 1-2cm taller then the ring. You do not want to over fill it, the result wont be pretty. You risk having a mess flipping them afterwards. It takes a couple of trials to make this perfect, theres no foolproof method to get it right the first time. Next you gently lift the pancake to check if the bottom is golden brown. Once it is, use a thong to remove the metal ring and spatula to carefully flip the pancake over to the over side. Cover and let cook for another 4 minutes at low fire again. 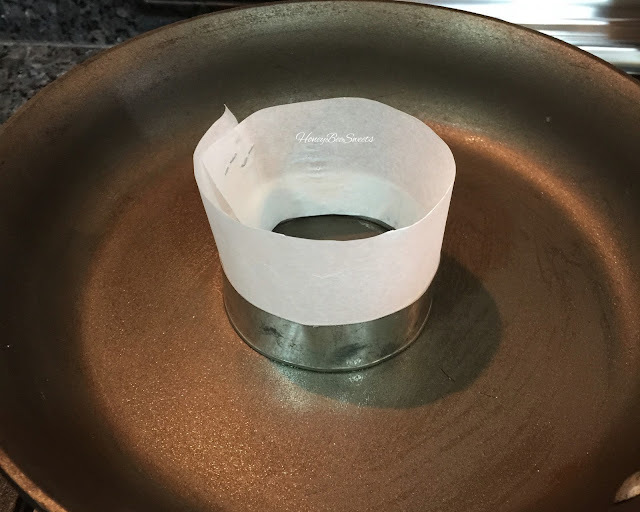 Once the pancake is done, you can carefully remove it from the pan can remove the paper liner around it. Repeat the whole process again till all the batter is used up. 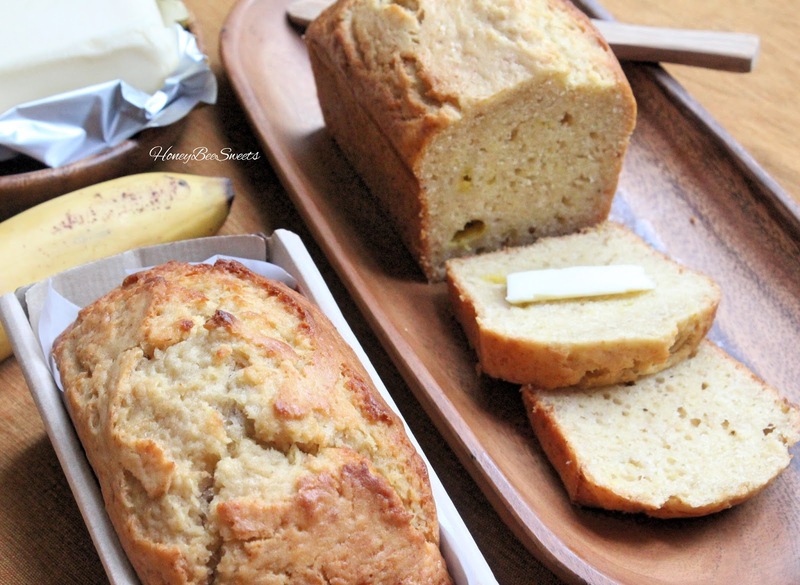 Serve it up with cold butter and sweet honey. Best thing in the world. Enjoy guys! Have a good time cooking! 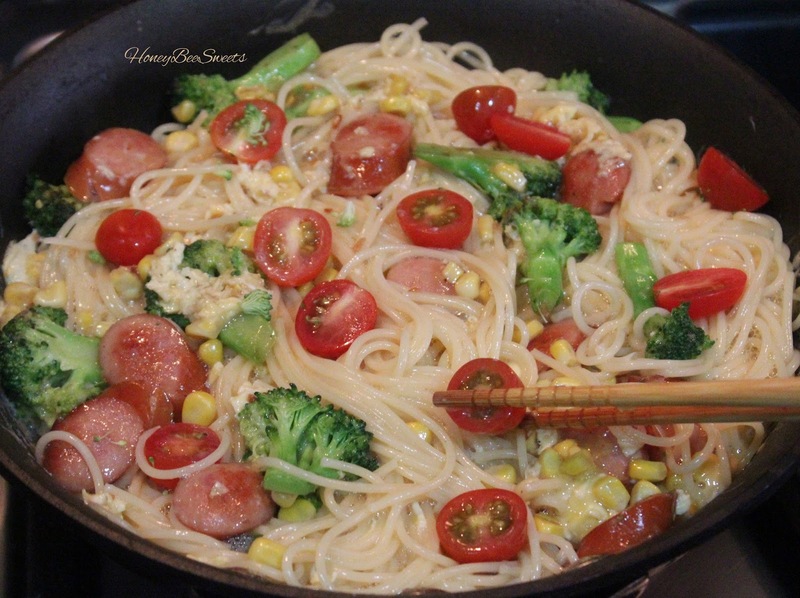 This simple dish consist of carb, protein and vegetables...really a complete meal on its own! So busy mums, do try this out, I can guarantee you the kids will love this. ;) Now let's check out what we need for this dish. Note that the ingredients amount is more then shown above. First you bring a pot of water to boil. 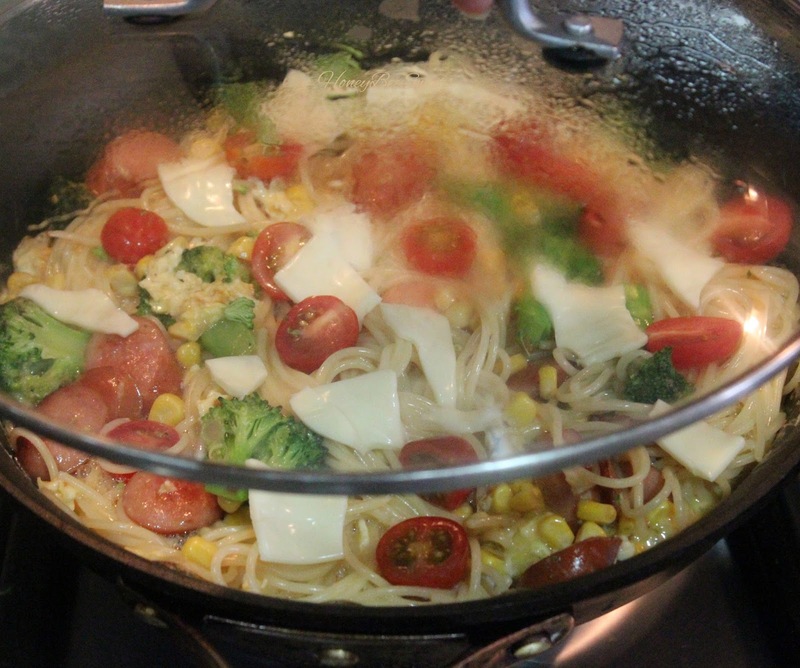 Add in the pasta to cook till al dente. 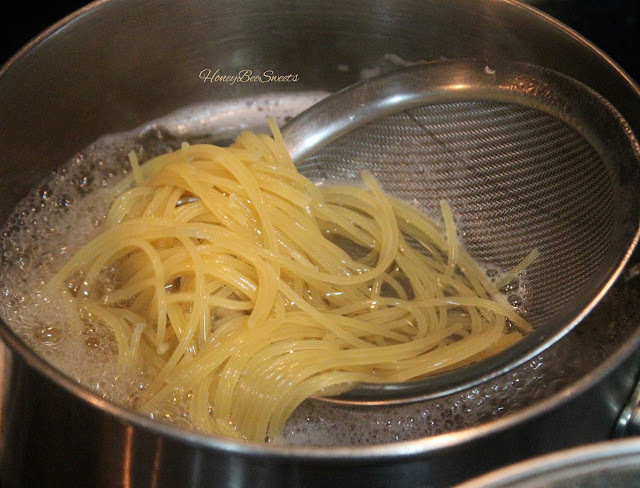 Next drain off the water and place the pasta in a mixing bowl. Add the oilve oil in, toss to coat it, so it won't stick together and form a big lump. In a saute pan, add in 1 tbsp cooking oil and garlic over medium low fire. Cook till it is aromatic, then add in the sausages. 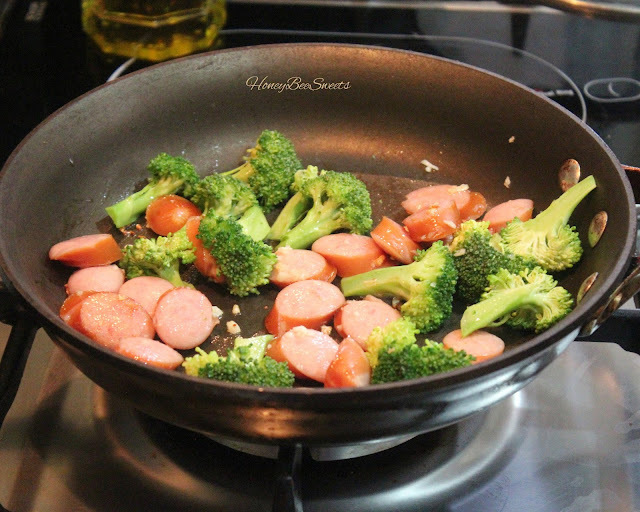 Stir fry awhile till you see the sausages are slight golden brown then add the broccoli florets. Next, add in the butter and sweet fresh corn. 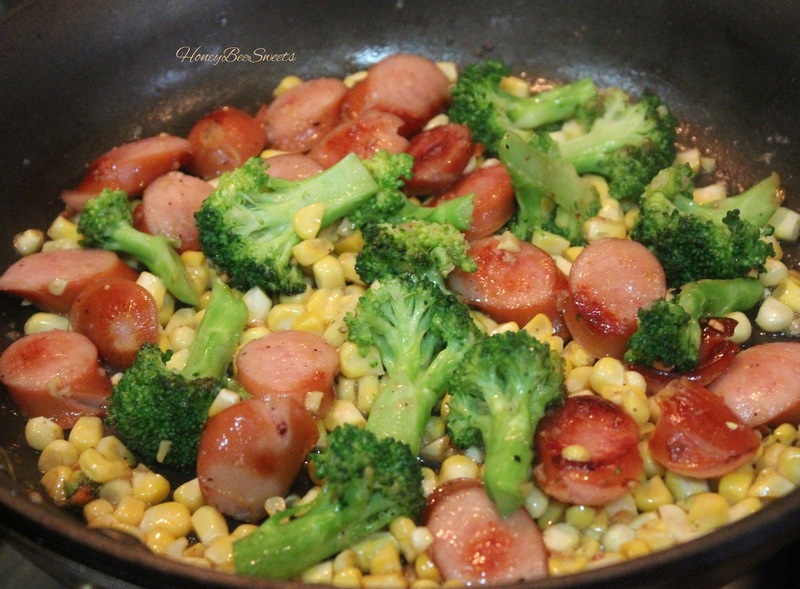 Cook till the butter melted and the corn is soften a little. 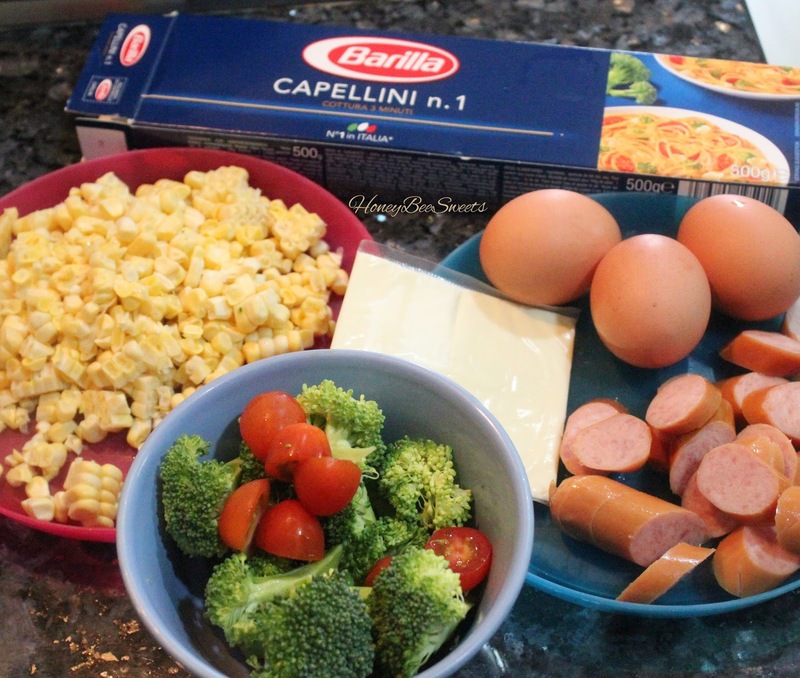 Remove from fire and set aside while you prepare the pasta and egg mixture. At this point, crack the eggs in to a mixing bowl, add in salt, pepper and the Hondashi powder. 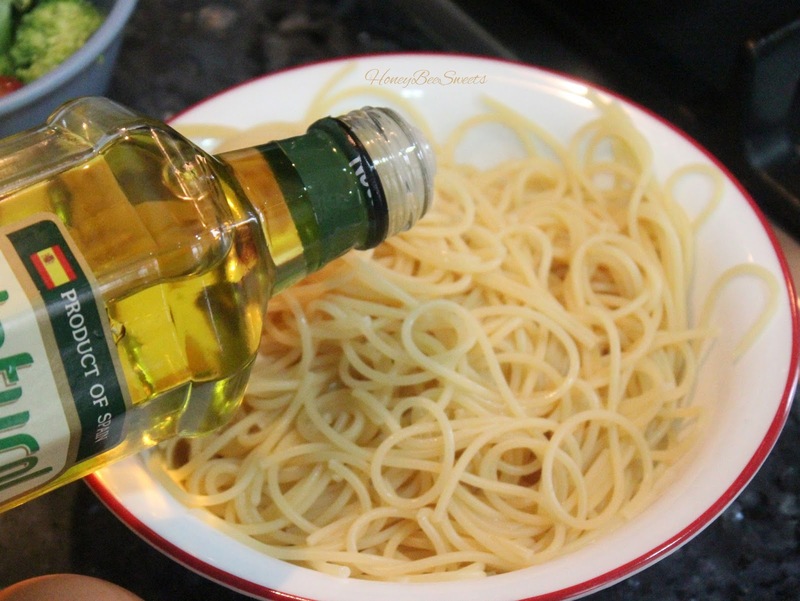 Mix well and then pour it over the reserved pasta. Then add the whole egg and pasta mixture over the sauteed vegetables. Arrange the vegetables so they are evenly spread out. Add in the tomato halves. Tear up the cheddar cheese slices and place evenly throughout the whole frittata. 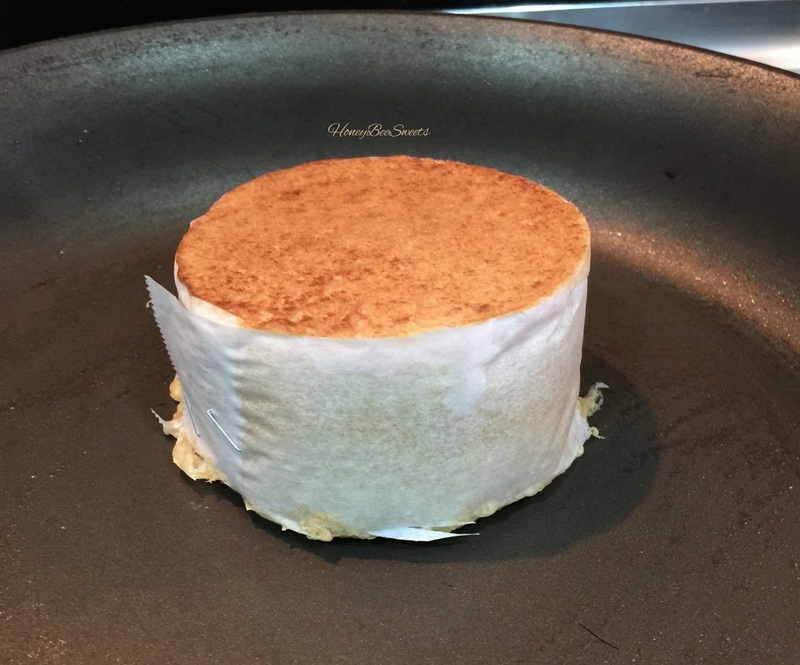 Cover the pan and cook at low fiire for a good 6-8 minutes, till the cheese is all melted in. Let the frittata cool slightly before slicing it to serve. 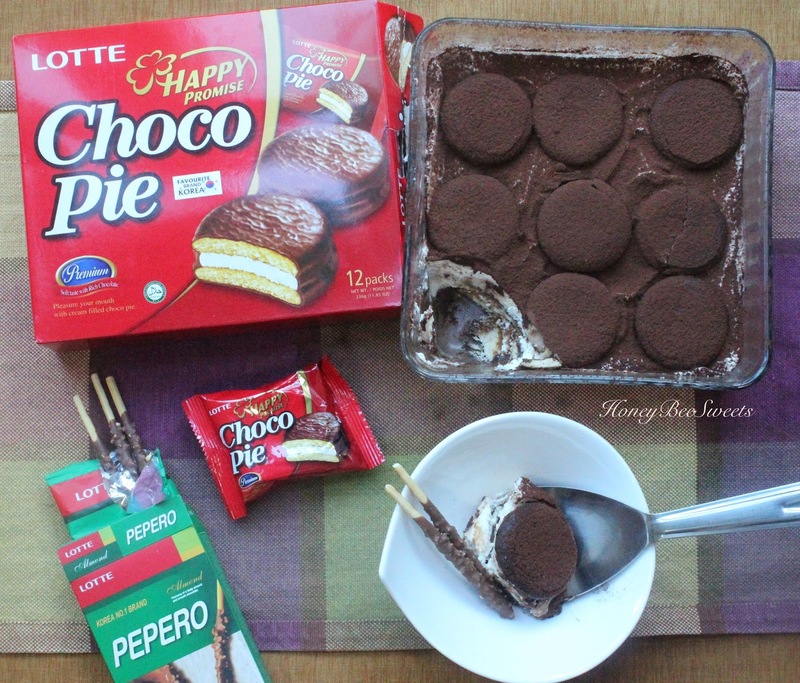 So recently I was given the challenge of using LOTTE Choco Pie to come up with an easy and yet delicious recipe. Yes, I ate a whole box of those to come up with a decent idea heehee. :D *Ahem*...excuses for pigging out. 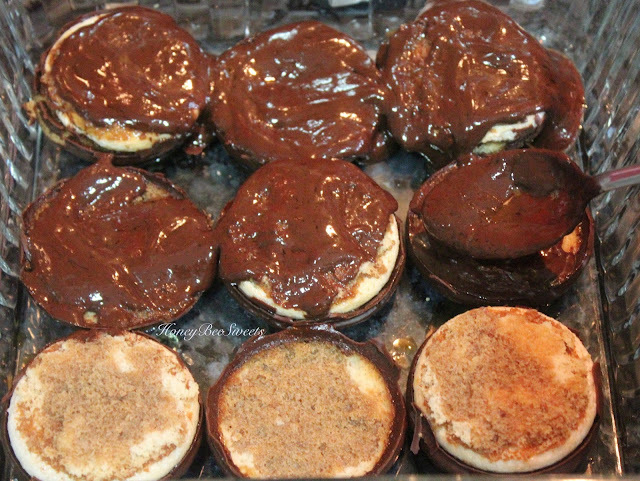 But it wasn't that hard really, Texture of the pie was mostly like a sponge coated with chocolate. 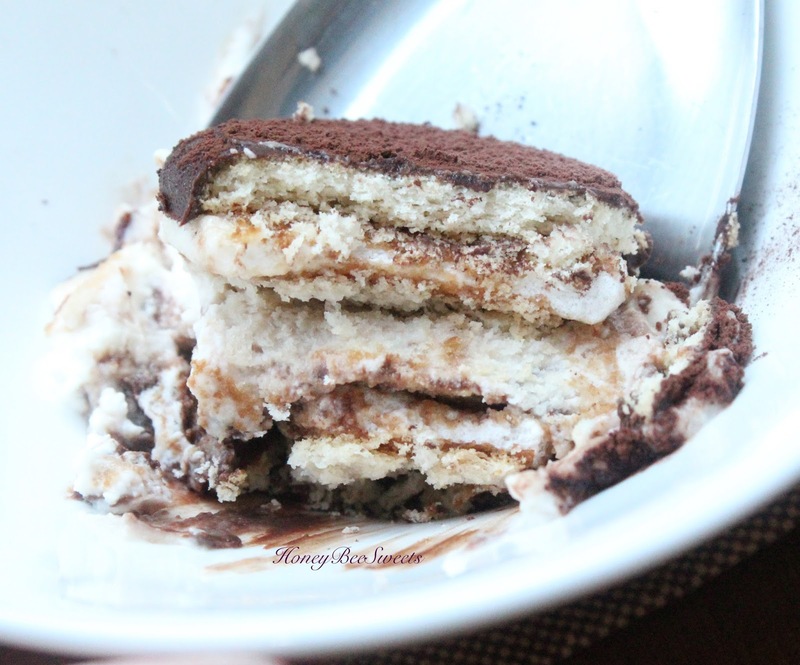 It somehow leads me to think of none other then Tiramisu cake. Chocolate coated sponge in a tiramisu? Wooo....sounds good already! I quickly got to work on it and voila! See what have I got ladies and gentlmen....Choco Pie Tiramisu! I used ToastBox Kopi-O pack to make the esspresso. Prepare a cup with 200 ml boiling water, add the coffee pack and seep for 5 minutes. 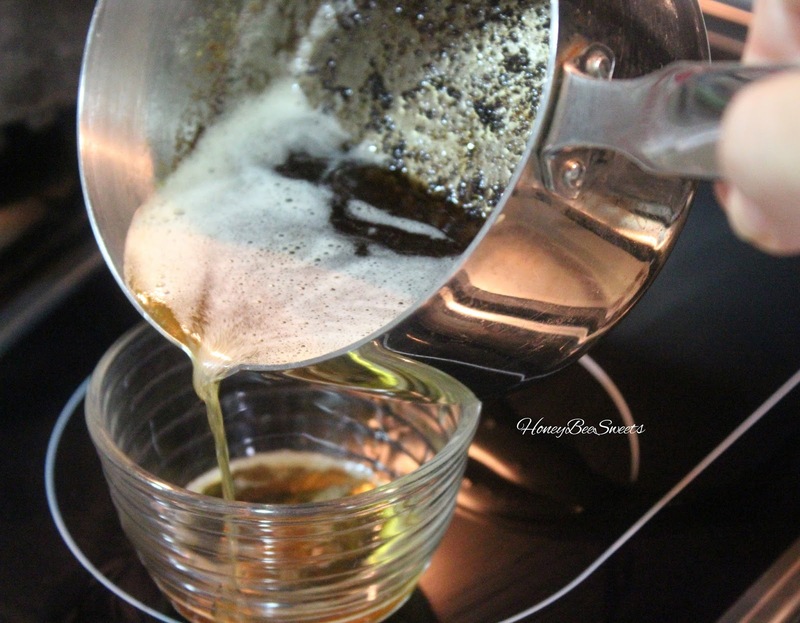 Then add in the coffee liqueur and stir well. Then chill the mixture in the fridge. Whip the remaining 3/4 cup of heavy cream and 3 tbsp of confectioner's sugar till stiff peaks. 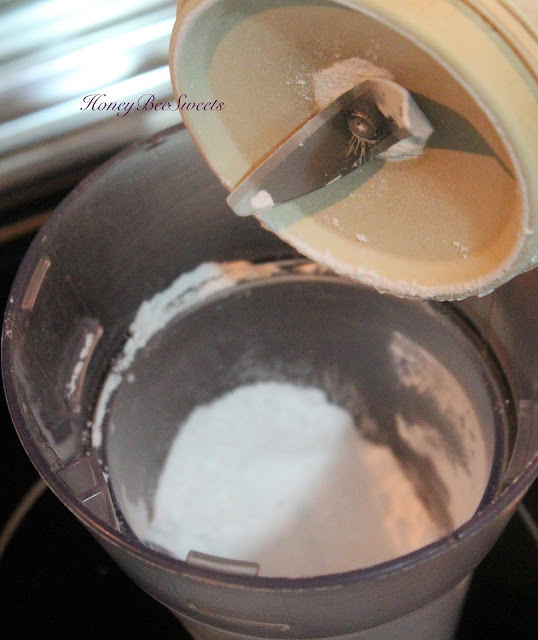 I run out of powdered sugar, so I blended some coarse sugar to make some. Verdict, I am not going to buy powdered sugar from now on haha! 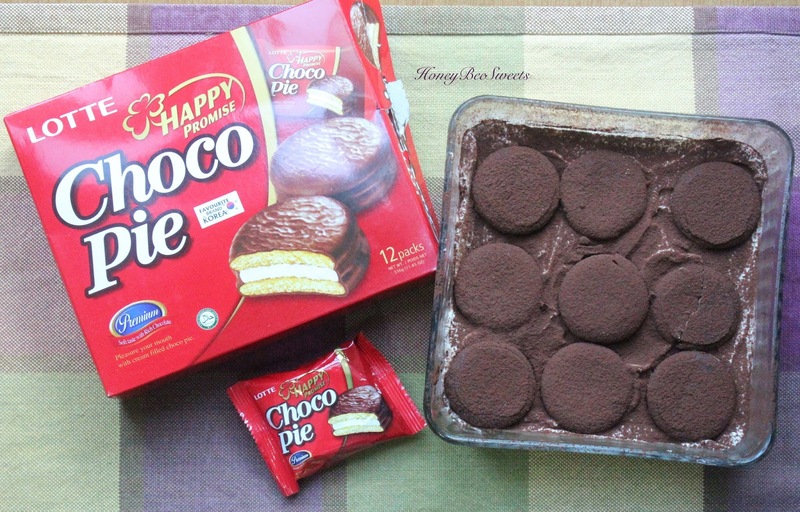 Now open up the Choco pies, gently open up the pie. One side will be with the marshmallow cream filling while the other doesn't. Lay them on the base of a raminkin. You will need 9 halves. Next you spoon about 1/3 of the espresso mixture over the pie halves to soak. 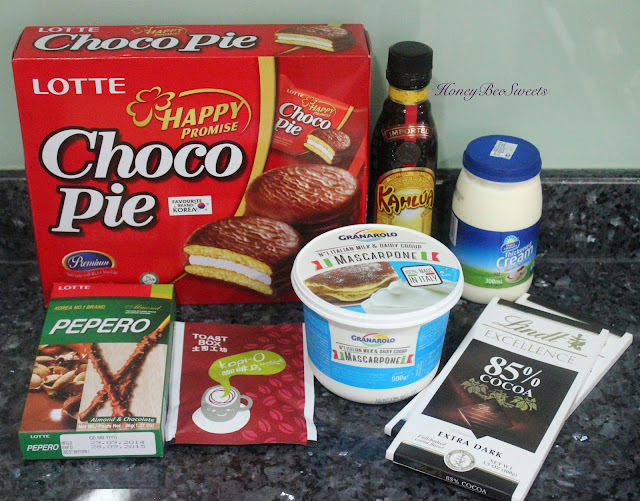 Spread 1/3 of the chocolate ganache over the pie halves. 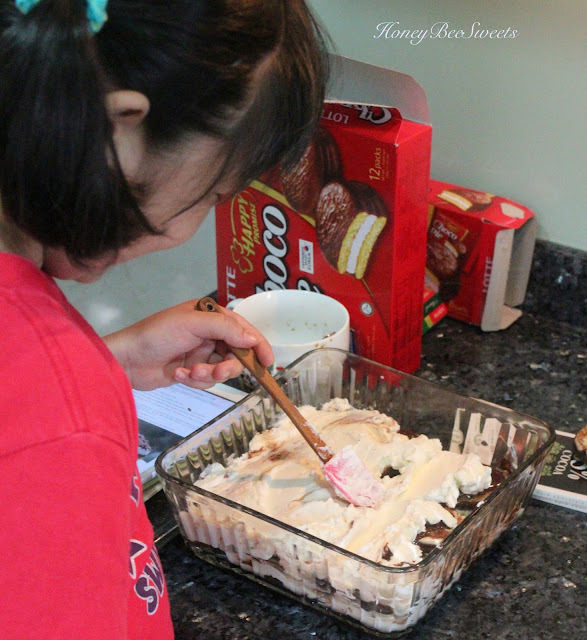 The last top layer of pie halves needs to be all open face down. Meaning the chocolate coated side facing up. 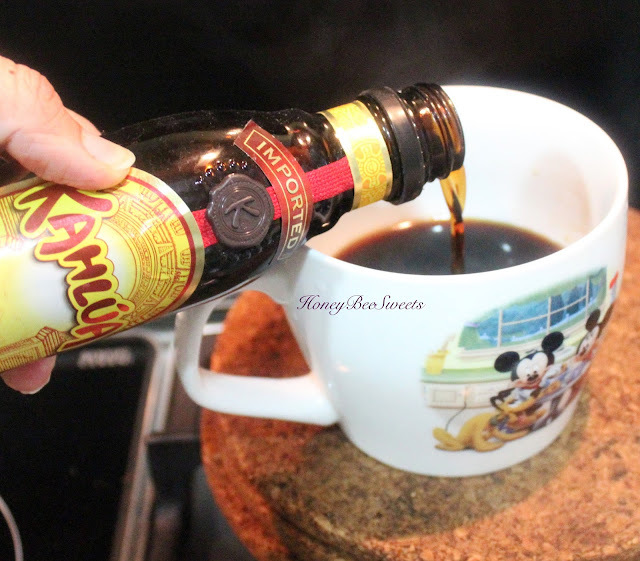 I suggest dipping the halves in the coffee mix before placing into the raminkins. Lastly just garnish the top with a good dust of quality cocoa powder. Chill overnight or at least 4 hours. 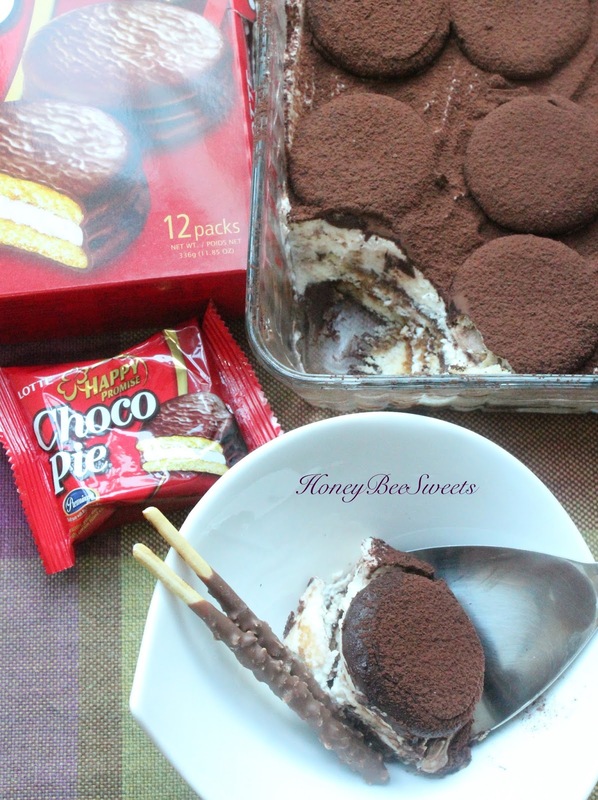 After chilling in the fridge for a good 4 hours or more, the Choco Pie Tiramisu is good to serve. I am pretty happy with the end result and know that my mission has accomplished. A delicious and yet simple to make tiramisu dessert made using the LOTTE Choco Pies. A much easier version which even my young kid can help out making. :) Not convinced? 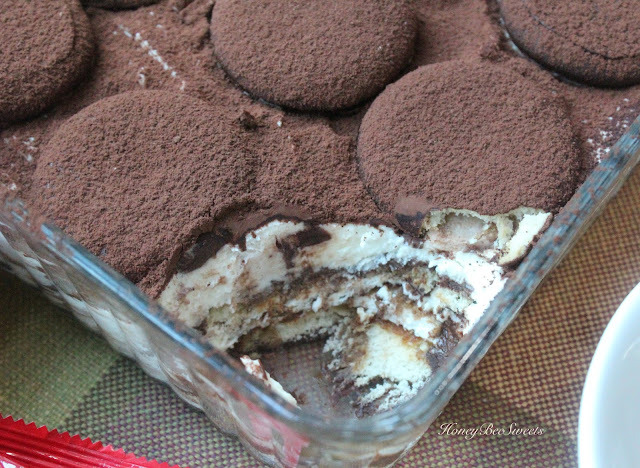 Just take a look at how good the tiramisu turned out. Key point to make this dessert taste really good is to make sure you soak the pie halves with the coffee syrup mixture. It literally melts in your mouth and leaving you with a smooth, deep coffee and chocolaty taste. In the meantime... Happy cooking! I wonder if I will ever run out of ideas on what kind of bread flavors to bake. Bread flavors are really up to your creativity, depends how far you want to go in trying out new ingredients. Frankly speaking, the one I am posting today ain't that new actually. I am sure someone probably had try this before. It just came into me when I realise I have some silken tofu left in the fridge after I used part of it to make waffles the morning before. A beautiful accident I must say, because this is such an awesome bread, plus it is a Straight Dough method, meaning no pre dough needed, woohoo! Addition of Kinako (toasted soy bean powder) makes it really aromatic. Plus that Kinako crumble topping, so delish! In th mixing bowl, add in all the ingredients except the butter. Knead it well till the dough comes together and pulls away from th side of the bowl. That will take about 10-12 minutes. You can stop the kneading for 2 to 3 minutes break in between. Add in the butter and continue to knead till it is very elastic and reaches the window panel. Leave dough in a greased bowl, covered and let proof till it doubles in size or for 1hr. After 1 hour, grease a 8" by 8" square baking pan. Preheat oven to 175C. Then punch out the air in the dough. And weigh out 30 g portions of dough. You will have 25 of 30g dough portions and 2 portions of 35g left. You can use these 2 extra dough to make filled buns. Roll round the 25 dough balls and line them into the greased square pan, 5 X 5. Let the dough proof well like shown in the photo above. 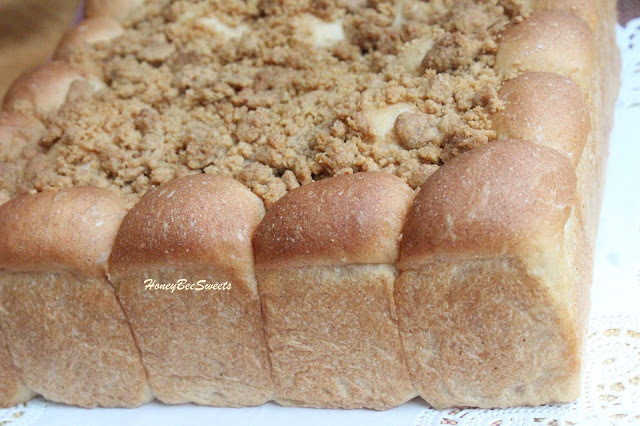 To make the crumble, mix all the ingredients together till it resembles crumbs. 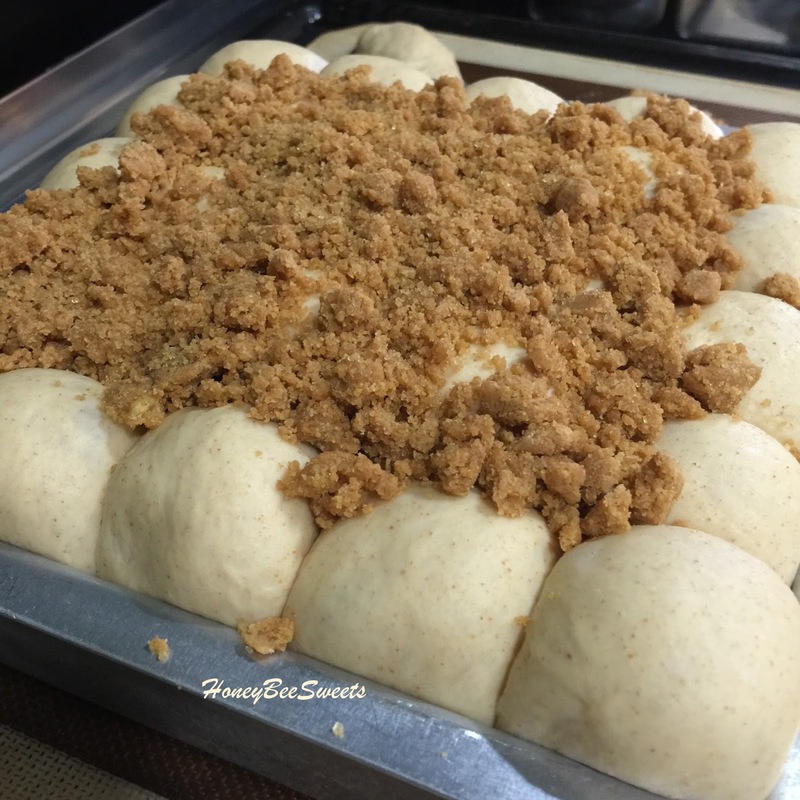 Sprinkle it over the top of the proofed dough. 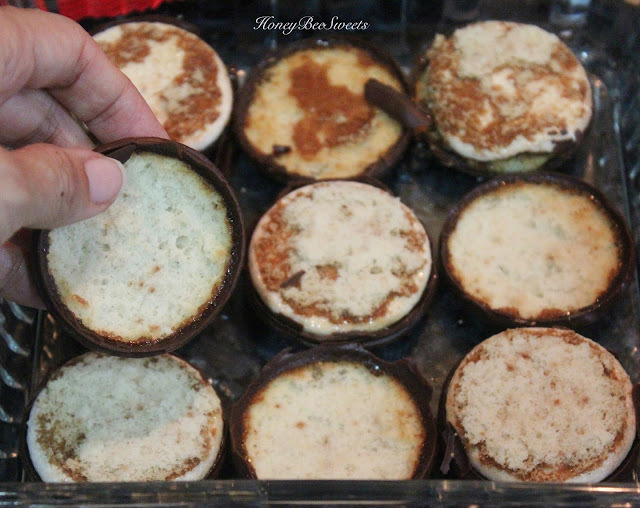 Bake the buns in the preheated oven till golden brown or 25-28 minutes. 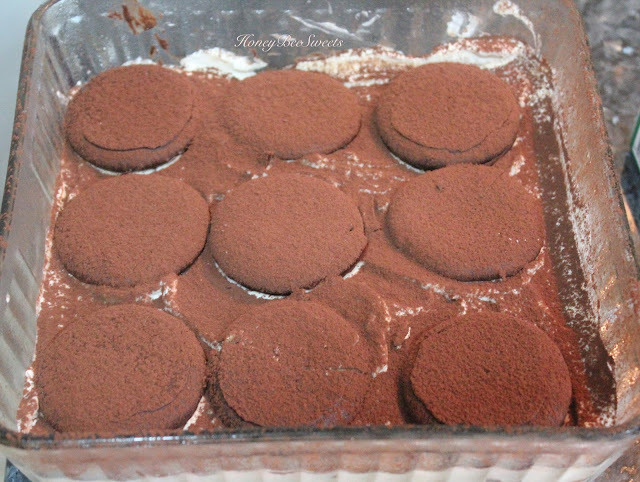 Use a foil to cover the top if it is browning too fast. Once baked, remove from the oven and let cool on the rack for 3 to 5 minutes. Then remove from the baking pan and cool completely on the rack. 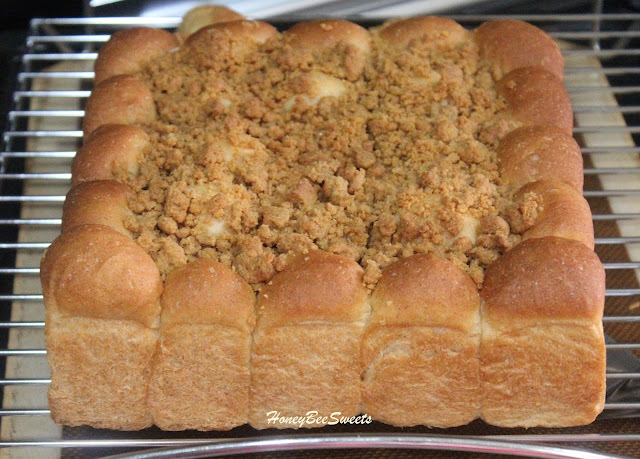 The only down side was the crumbles not staying crunchy the following day even though it is still yummy. Bread texture was excellent though, staying soft and fluffy throughout the 3 days until I worry little mould will start growing on them haha! 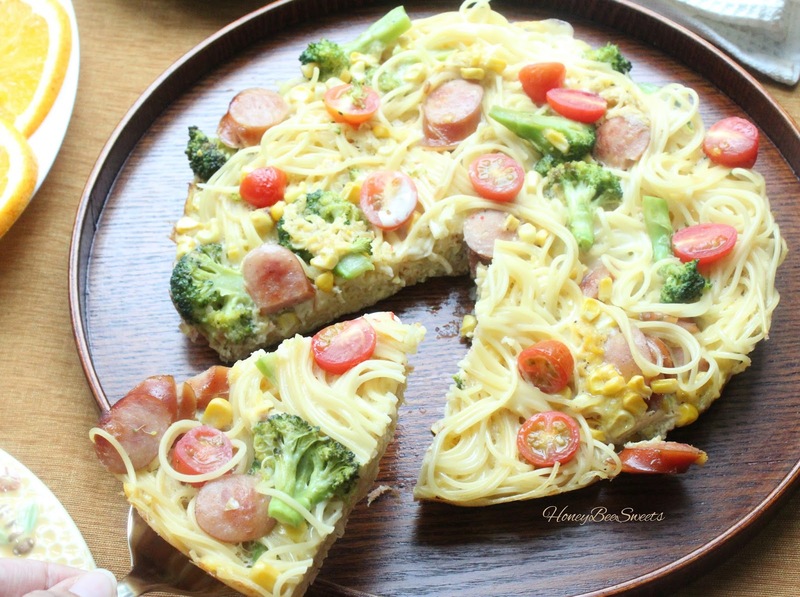 Hope you guys will try and like this recipe!